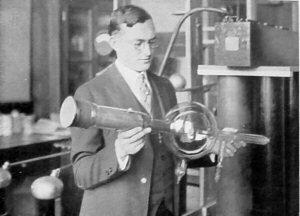 The Cathode Ray Tube site, X-Ray tubes. 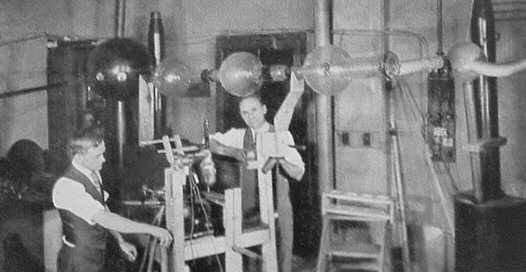 In this lab model every bulb is fed with 300KV, the tube was 2,4 meter long with bulb diameters of 30cm! 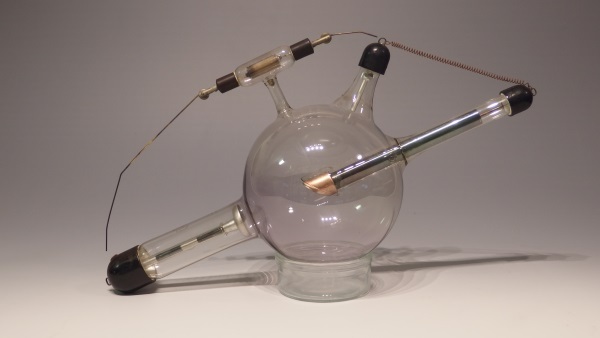 This rare rectifier tube invented by the physicist Sir Oliver Lodge prevented reverse currents which occurred using Ruhmkorff coils. 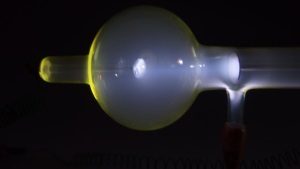 The unversed voltage had a negative effect on the pressure in the Ion tubes. These rectifier valves prevented these unversed voltages. The valves were used in series with the X-ray tube. 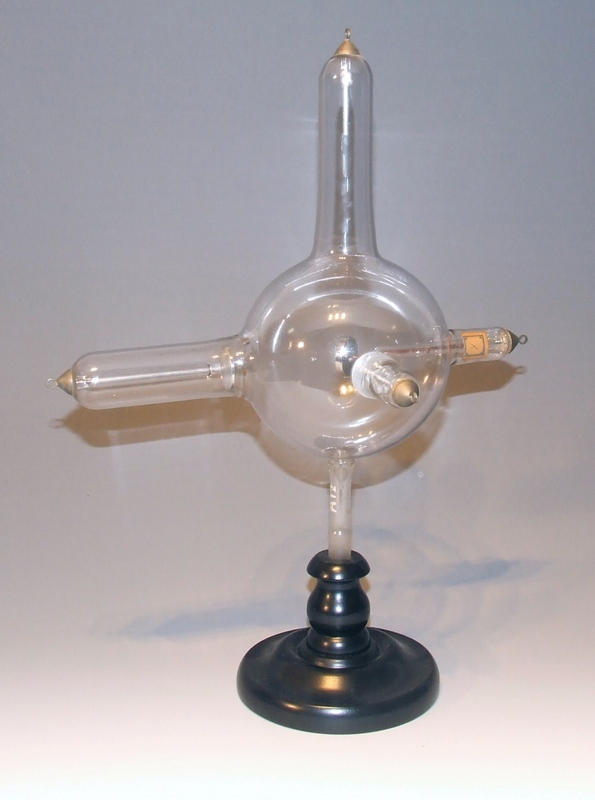 The Cathode inside the tube is an aluminum spiral which creates a larger surface for handling high currents. 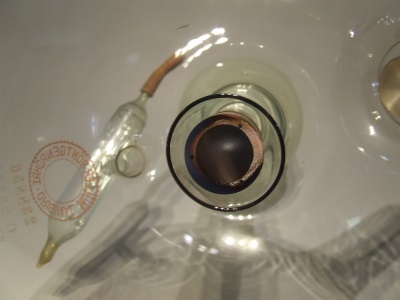 The distinctive red colored glass is the result of a specific exhaustion method which keeps the vacuum stable under all conditions. Pictures courtesy of Alastair Wright. target (due to the high melting point of this metal). 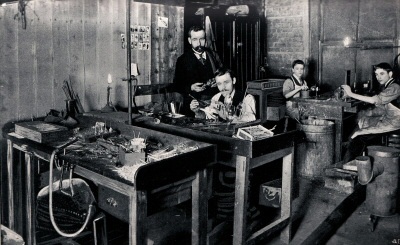 German factories of Gundelach, Müller, Pressler and Siemens. But also Andrews in England. vacuum and cooling. Some described them as unpredictable as a woman. 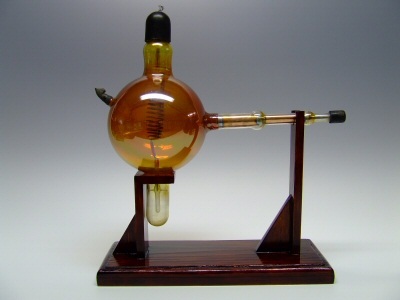 heat away and therefore increased the capacity of the tube to withstand a high current. was safe to use with the high voltage. 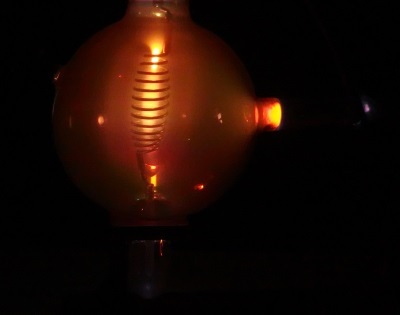 The anode face was changed to an angle of 19º in respect to the cathode. X-ray demonstration tube for Gaede pump use. This tube has blue glass terminals. 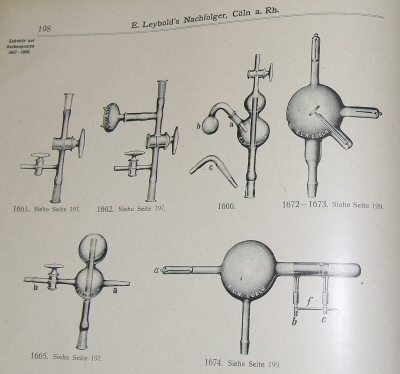 Picture from the Leybolds Nachfolger catalogue 1911. 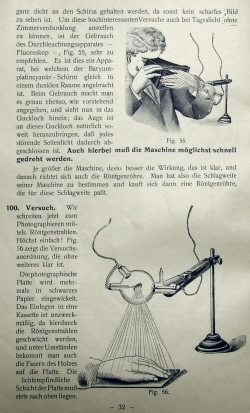 This picture comes from the Leybolds Nachfolger catalogue from 1929. 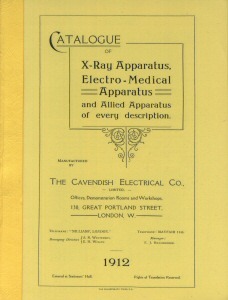 In this catalogue the tube is only printed in combination with the Gaede pump and not available anymore as a separate item. The reference number points at a new type. 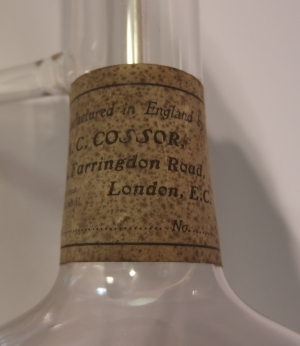 This dates this tube before 1929.
for use on a Gaede pump. Advert from the Bing 1912 toy catalogue. 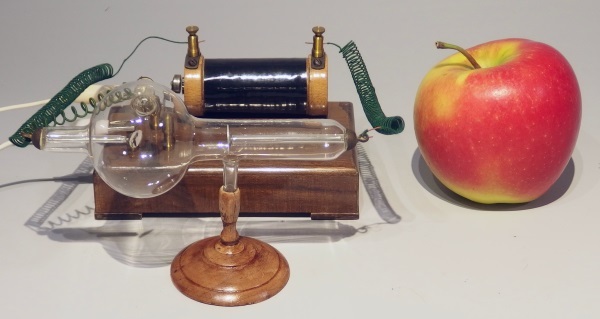 Around 1900 many educational different Physics boxes were sold for amusement or Christmas gift. 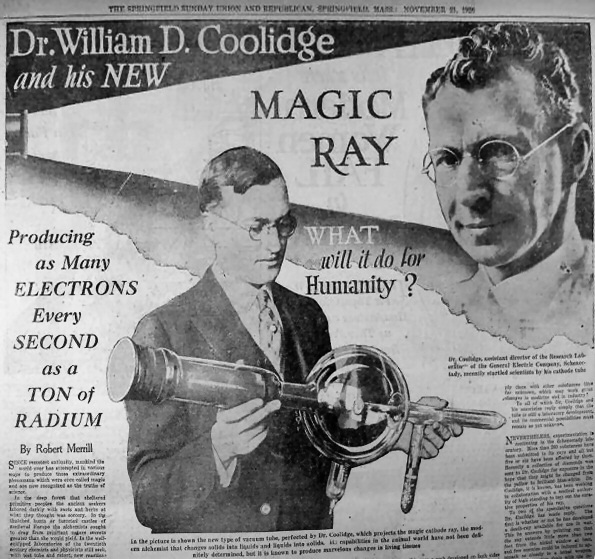 Many kids were experimenting with the newly discovered techniques like electricity and even X-rays without warning! von Dr. C. Richard Schultze. Huge water cooled C.H.F. 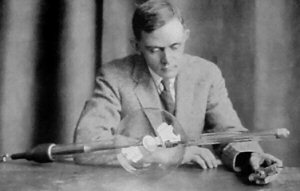 Müller Rapid X-ray tube (1926). 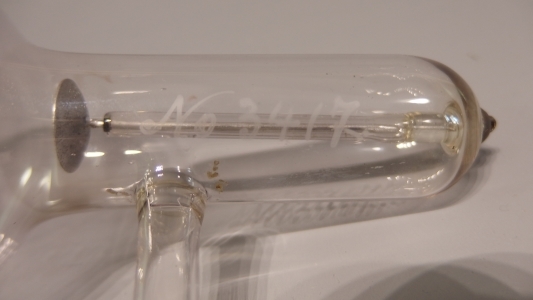 This tube is a result of many years of development, the first Müller Rapid tubes date back to 1911 and were patented. 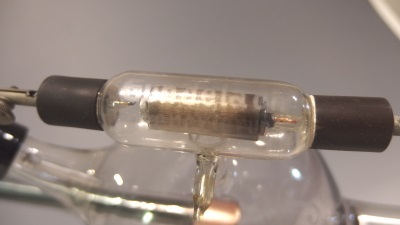 The copper block connection of the anti-cathode to the glass is special in this tube. The anode is hollow for optimum cooling of the electrode with water. The Bauer air valve regulator. 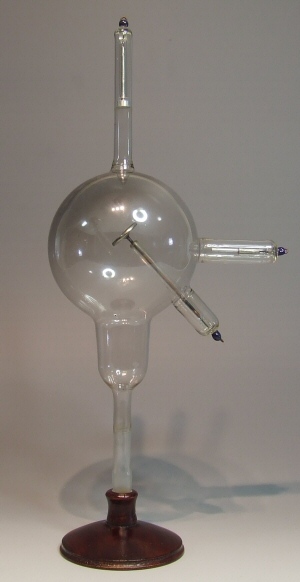 This regulator was used to regulate the vacuum to the optimum pressure. 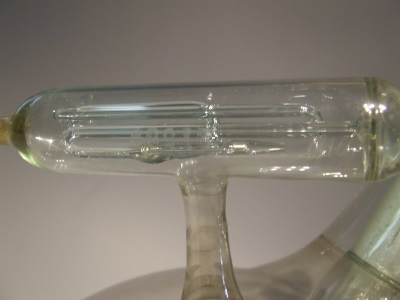 Inside is a folded thin glass tube containing a bit of mercury. 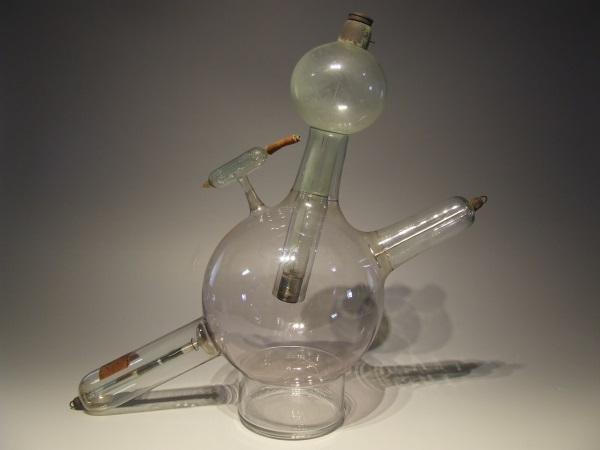 Attached to the rubber hose was a pneumatic piston to move the amount of mercury allowing a bit of air slipping into the tube softening the hardness of the X-ray tube. Click here to see it working! 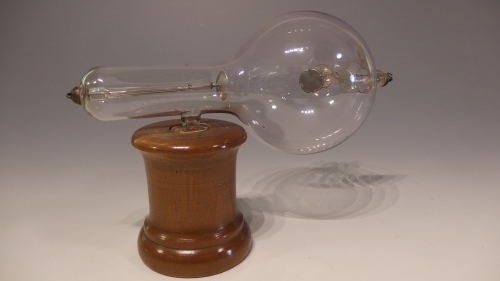 lenght 40cm This model is made around 1910-1912. 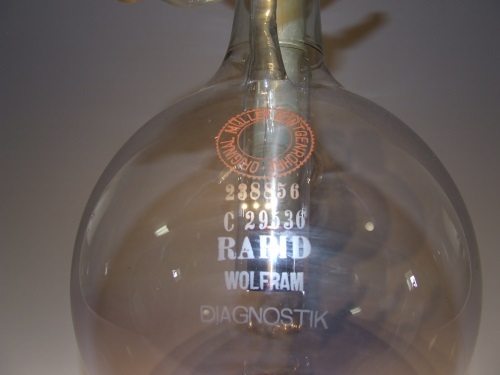 On the sphere there is a J etched, this was used by Gundelach for marking tubes made for rectified alternating voltages, probably for use with the "Ideal Apparat" made by Reiniger Gebbert & Schall. 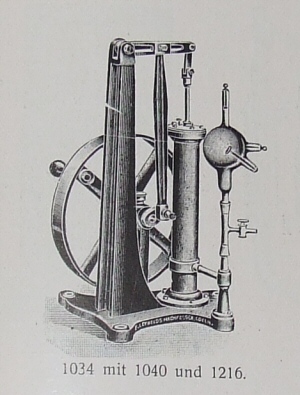 The Gundelach vacuum regulator for regulating the " hardness" of the tube. Smallest kids working X- ray setup ever seen! and no harmfull x-rays are produced. 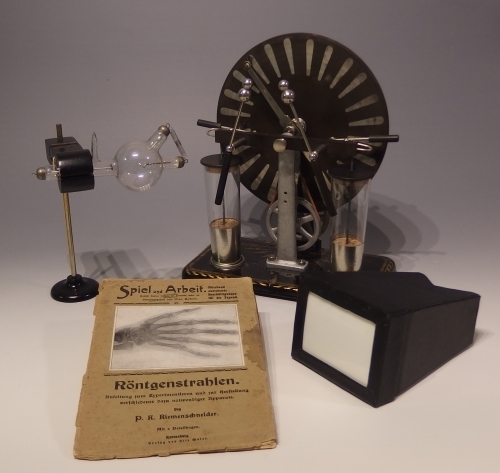 A small 15cm fluoroscope screen made by the German company Heyden ca1910, an Ampere meter made by the French maker C.G de Radiologie and an English indicator tube ca 1910. 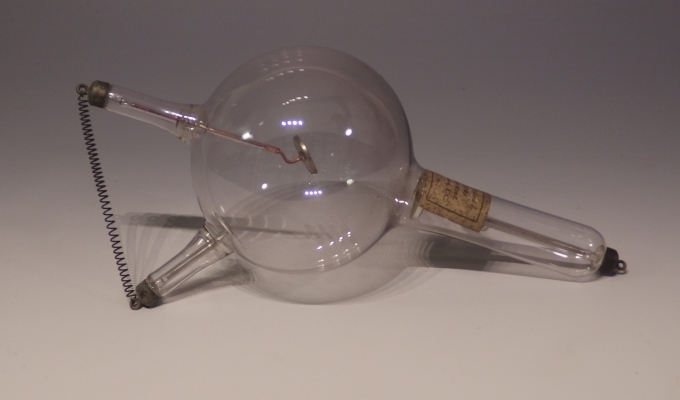 The indicator tube was placed in series with the X-Ray tube to see if there was a reverse current present. 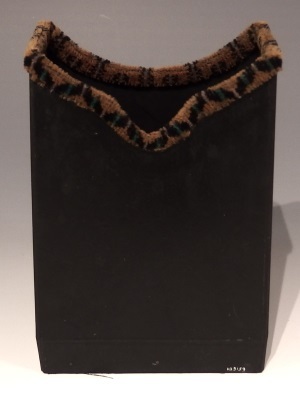 The working of an indicator tube shows the typical reversed current of a Ruhmkorff coil, Ionisation around both wires, there is a bit more forward current than reversed. 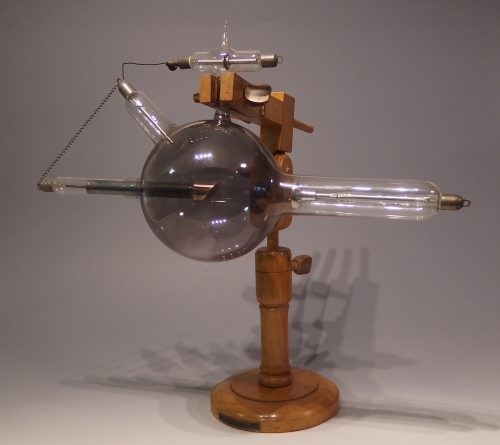 Due to this phenomena most early X-ray tubes degraded and eventually were not useful anymore. 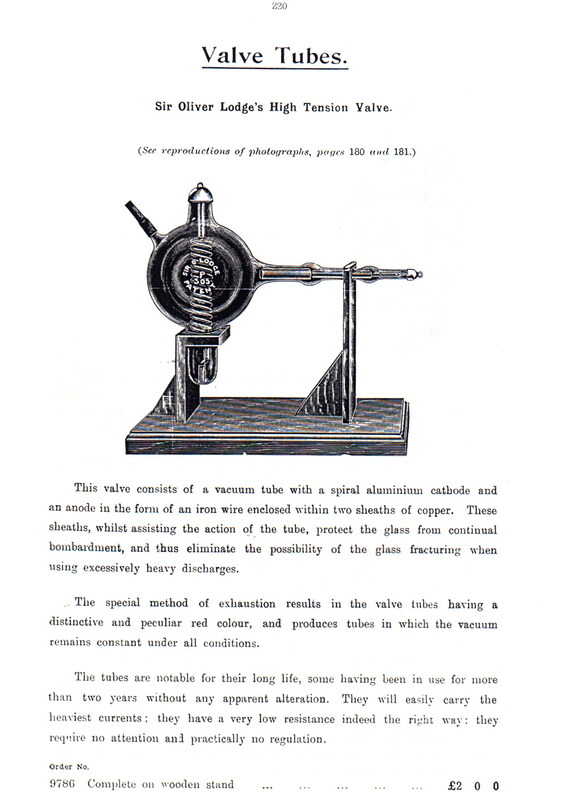 Placing a valve tube in series with the X-ray tube prevented this negative effect. With a true DC current only one wire will ionize. A viewing device with a fluorescent screen in the front. 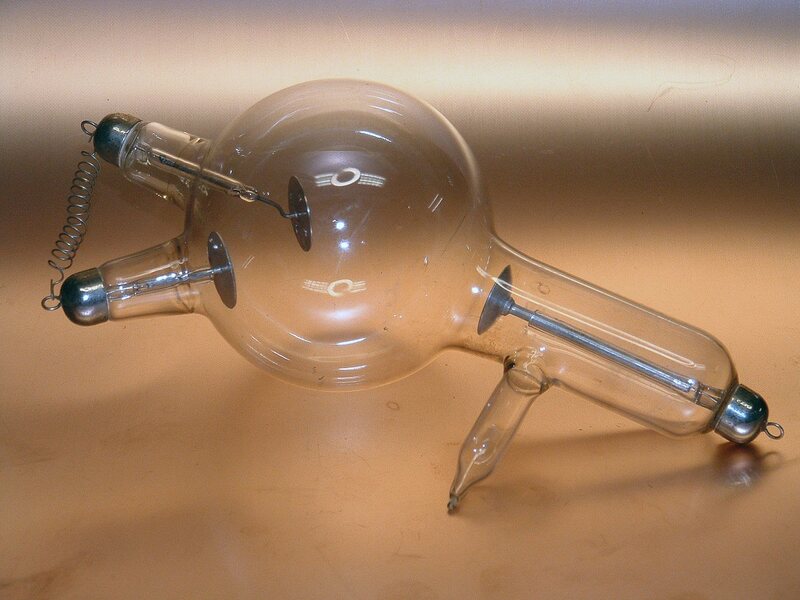 X-ray tube ca 1910 maker unknown but likely from the French Giaffe & Pilon company. In front a German DIY X-ray booklet for kids. 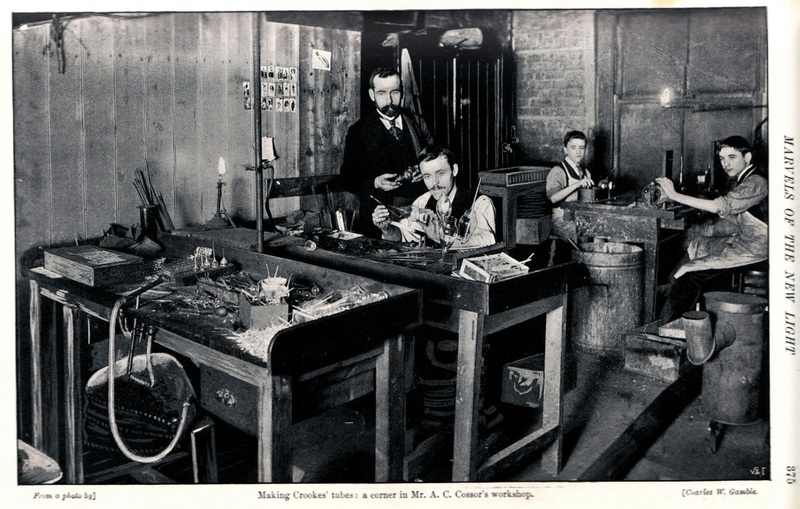 The glass tube workshop of A.C. Cossor 1896. 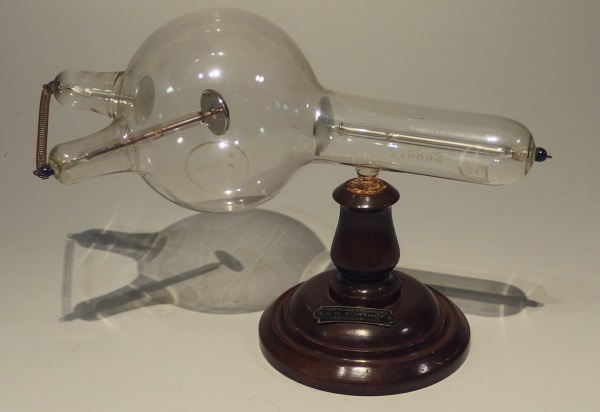 An indicatortube made by CHF Müller.